Norton has confirmed an exciting all-Australian line up for their 2016 Isle of Man TT Races fuelled by Monster Energy campaign. 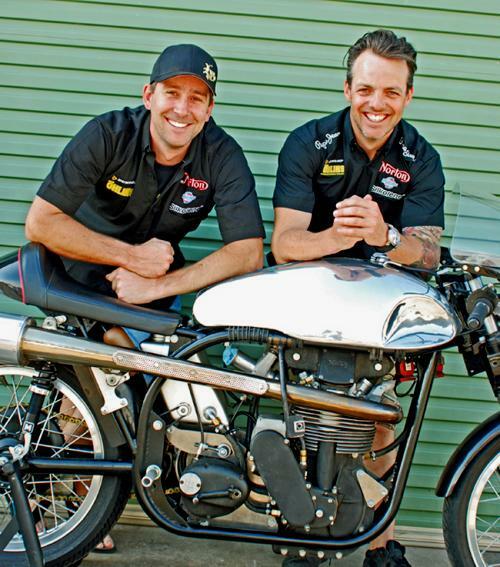 The Castle Donington based marque has signed Adelaide rider David Johnson alongside Melbourne’s Cameron Donald, who has raced for the team since 2014 The pair will compete in the RST Superbike and PokerStars Senior TT on the SG5 Norton. Glenn Richards has been brought in as development rider with Mick Grant continuing as team advisor. Cameron made his TT debut in 2005, finishing as the fastest newcomer, which he followed up in 2006 with a sensational runner up position in the Senior TT. His most successful year on the Mountain Course, 2008, saw his only victories to date, winning the Superbike and Superstock races. He has already achieved Norton’s fastest ever lap of the Mountain Course and last year finished in the top twenty in the Superbike class. Fellow countryman Johnson, who made his TT debut in 2010 winning the Newcomers Trophy, is one of road racing’s rising stars. He has a highest placed 4th from the 2014 RL360 Superstock Race and finished in the top ten last years in both the Superbike and Senior TT as well as the Superstock and Supersport 2 Races. He has a fastest lap of 131.595 mph, which he set in 2015, which puts him the 9th fastest rider in history. Johnson is one of a new breed of riders equally at home on the roads or circuits, ending the long established myth that to be successful that you have to specialise. His short circuit career has seen him be a regular front-runner and podium finisher in the British Superstock Championship.